An online appointment scheduling platform that leaves nothing to be desired! Try eTermin free of charge for 30 days and discover all features. Professional appointment management starts with the eTermin online booking software. Speed up your direct business! With eTermin, you offer your customers the possibility to access all available appointments online and book one right away. We integrate the eTermin online booking widget into your website and adjust the layout according to your needs. Access your online calendar anywhere and any time. 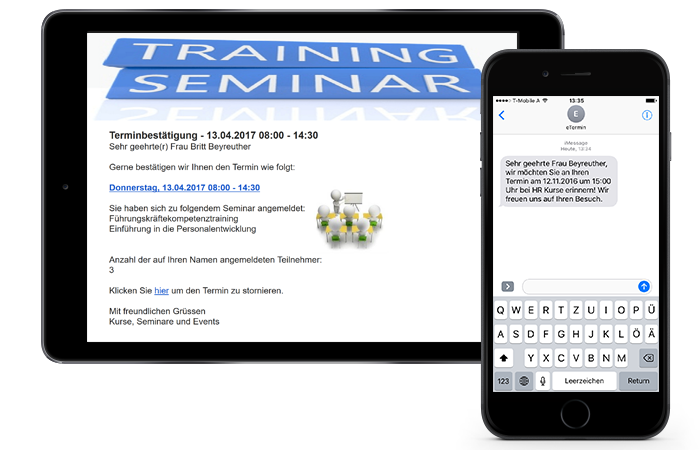 eTermin has been optimised for all mobile devices so you and your employees can manage your appointments while on the road in a quick and easy fashion. And even better: If you postpone or cancel an appointment, your customer will automatically be notified of the changes via text and e-mail. Handy day, week, month and list views. 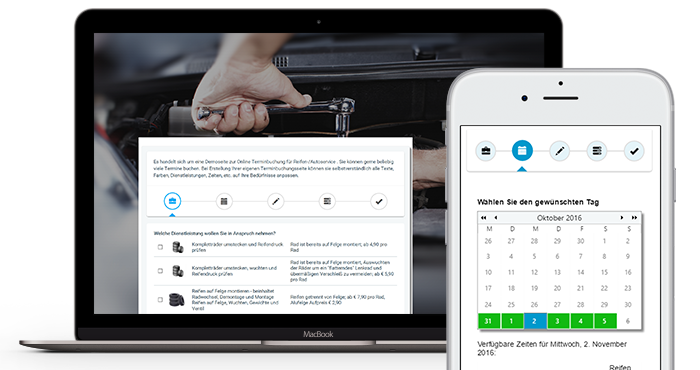 Thanks to the automatic transmission of all online bookings to the eTermin calendar, you're always on top of everything. 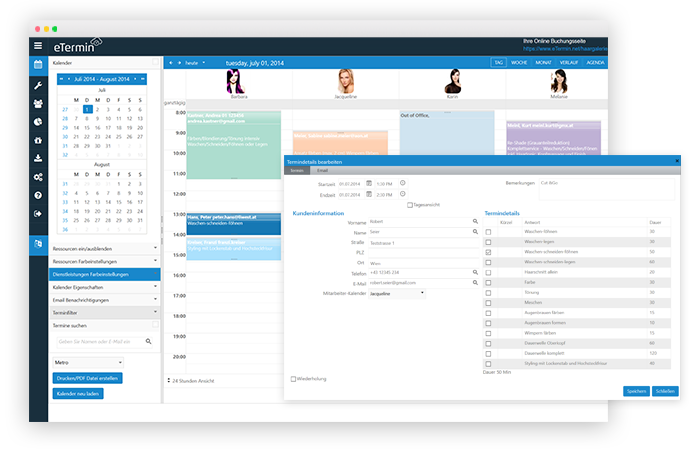 Your appointments can be synchronised with all popular online calendars (e.g. Outlook, Google, iCloud, and iCal). The synchronisation works both ways. That way, appointments can be created and edited in a quick and easy fashion. All corresponding customer data that is created automatically during the first online booking will be synchronised as well. If an existing customer makes an appointment over the phone, entering the name or the e-mail address manually into any online calendar is enough for eTermin to gather the customer's remaining details and correctly match them. 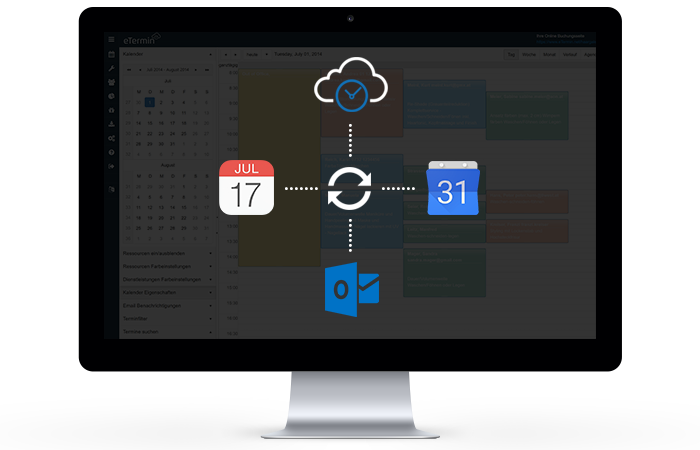 Reduce no-shows with eTermin's automatic appointment reminder feature. Your customers will be notified in time of the upcoming appointment via e-mail and text. This manner of reminding customers of an appointment is less intrusive than a call, improves your customer service and saves you valuable time. The notification message and the time it is sent out can be chosen at your discretion. 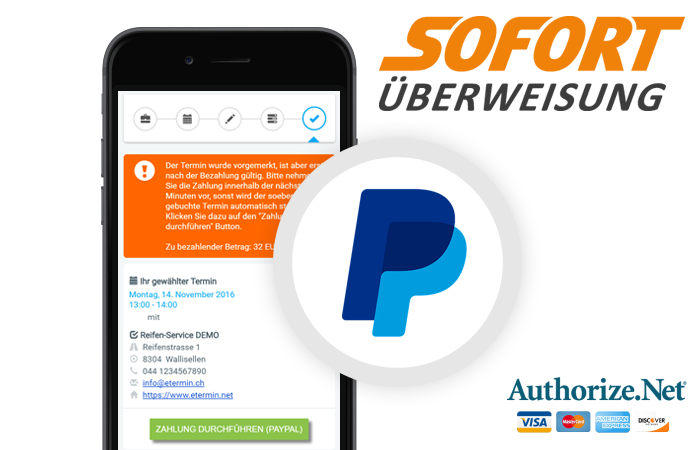 With eTermin, your customers can pay for booked services in a convenient and quick fashion with PayPal, credit card or SOFORT online payment. That way you get your money faster and will not have to worry about outstanding payments any longer. The payment feature can be configured at your discretion. Additionally, you can use eTermin to create invoices, offers, etc. in next to no time. 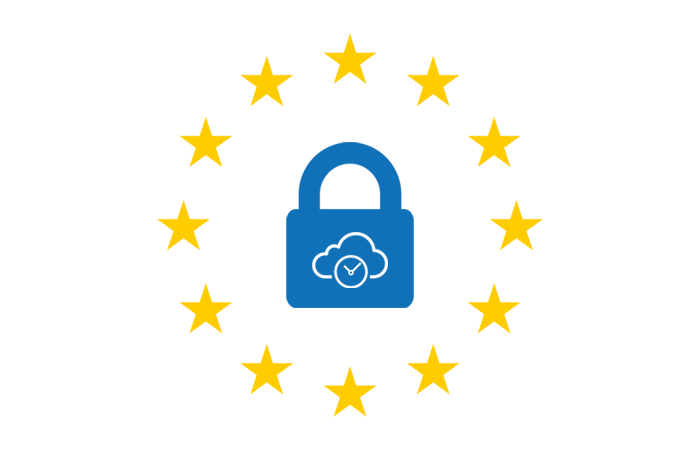 eTermin makes sure that your business and customer data are securely protected. All data transmissions are encrypted and subject to strict Swiss privacy laws. The eTermin online booking system uses SSL (Secure Socket Layer), a connection that guarantees the highest level of protection and is also used for online banking systems. Show your customers what you have to offer. 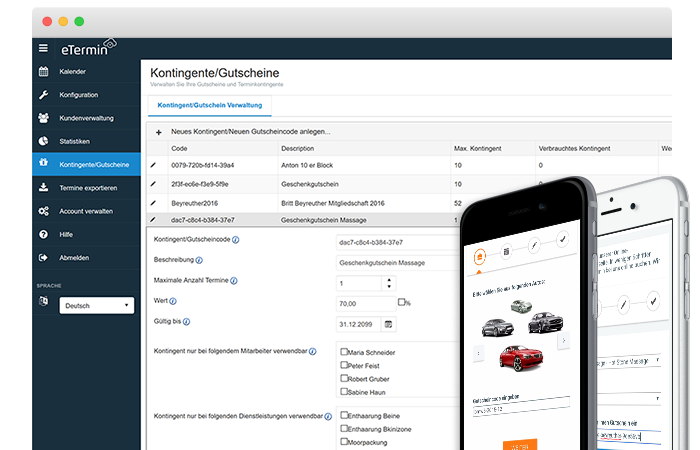 Using eTermin, you can define your entire service catalogue with just a few clicks. Categorise all services that can be booked online in a quick and easy fashion. Additionally, add images, detailed descriptions and prices. Define the duration as well as preparation and follow-up times. Once the booking is complete, the details regarding the time and services will automatically be added to your calendar. Create a personal profile for yourself and your employees and add defined work hours and services. That way you make sure that your customers can only book services with a specific employee who is actually available. 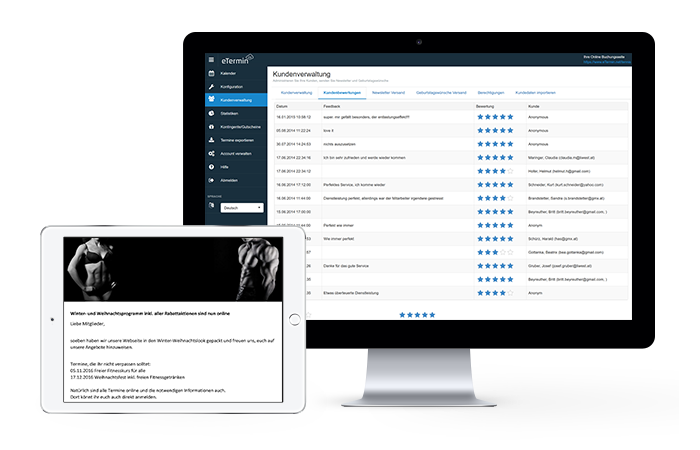 eTermin allows you to manage every employee profile in an easy and centralised fashion or to grant your employees individual access and editing rights. 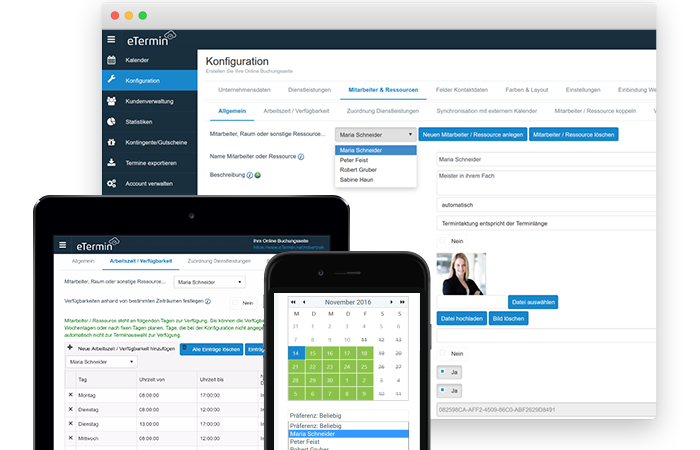 eTermin makes customer and appointment management easy. If a customer makes an appointment online, their details are automatically added to the system. That way you always have an overview of all necessary information and all booked appointments. Additionally, eTermin supplies you with an analysis of your employee workload and the frequency of booked services. The integrated search feature helps you to locate this information in a quick and easy fashion. Create and manage codes for vouchers and appointment packs . 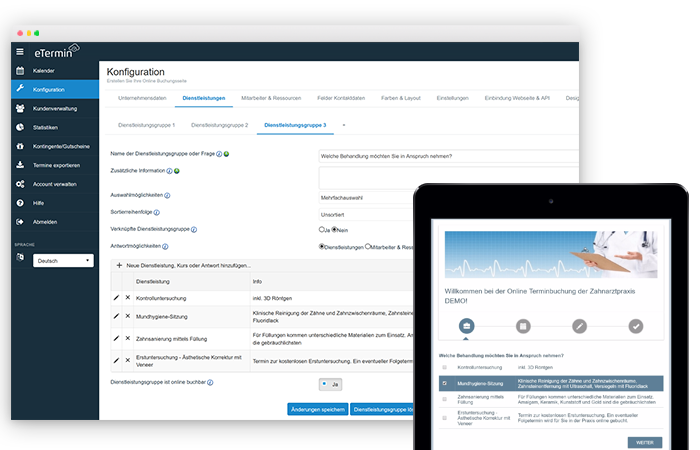 eTermin allows you to configure promotions and vouchers or packs, e.g. by service, date or number of persons. Additionally, you can define other booking options, for example whether an allocation or coupon can only be used with certain or all employees. eTermin offers you quick, easy, and successful marketing. Direct your customers' attention to offers, discounts or coupon promotions and target your advertisements to new services or specials. The online booking system offers you a variety of features you can use to plan your marketing activities and implement them effectively. Make your customers remember you and turn them into loyal fans of your business - for example through automatic birthday messages, personalised newsletters, or promotions. 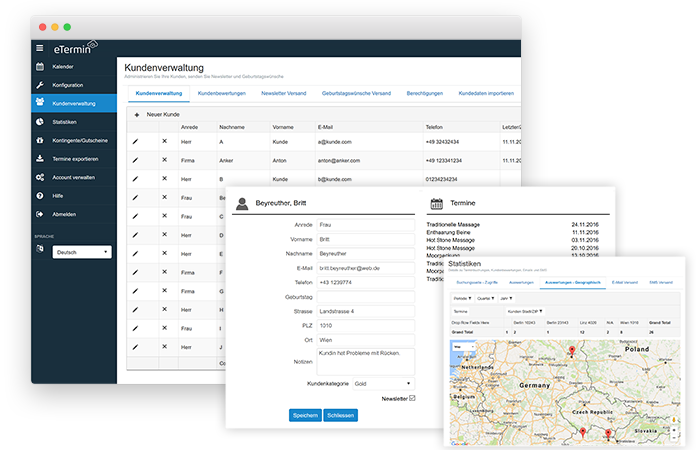 Using the open eTermin programming interface (API), you can directly synchronise your tools, systems or apps with the eTermin booking system. That way you can transmit customer or booking details to another web-based software after every appointment booking. Additionally, you can import and export all customer and booking details as a list to all popular file formats. 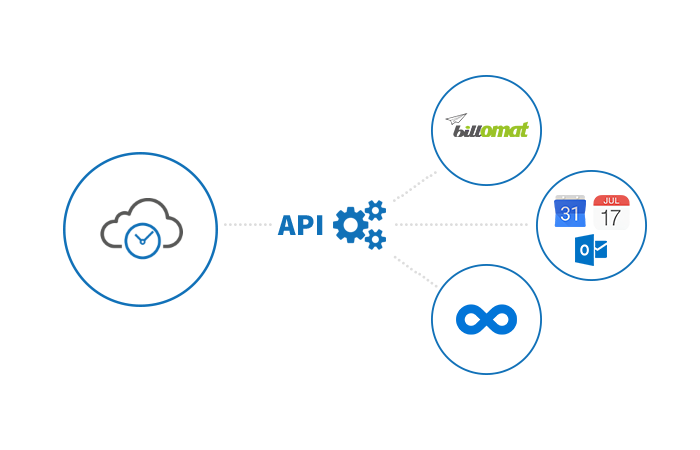 The eTermin API allows you to synchronise data with other systems and automate typical work scenarios. This means less typing, fewer mistakes and less work for you. No matter what you need - eTermin has it! Discover all features of the multi-functional online booking system.